In part 2 of our Parse + Facebook tutorial series, you’ll wrap up the image sharing app with image wall and comments features. Welcome to the second part of this two-part Parse tutorial series that focuses on integrating both Facebook and Parse into your apps. In Part 1, you learned how how to set up a project with Facebook and Parse SDKs, authenticate a user with Facebook using Parse’s Facebook toolkit and retrieve Facebook user information using the Facebook Graph API. In Part 2 (you are here! ), you’ll build a data store for your images and comments in Parse, display uploaded images on an image wall and add a comment system to your app. Make sure to modify the FacebookAppID in the project’s plist file as well as the Parse App ID and Parse Client Key in the AppDelegate to match the keys you generated for your Facebook and Parse apps. Be aware that URL Scheme section for adding your Facebook URL will be in a different location in the Info tab. Let’s get back to wrapping up this app! The first requirement for your image wall is a data structure for the images and their respective comments. You’ll store the data in a singleton class named DataStore. Create a new Objective-C class that is a subclass of NSObject. Name the class DataStore. The code above serves as your singleton DataStore. Calling [DataStore instance] anywhere in your code will return the shared instance of DataStore so everyone is working with the same data. fbFriends is a dictionary containing the FBGraphUser objects of you and all your friends, keyed on Facebook user ID. wallImage is populated with the Wall’s image objects that are returned from Parse. wallImageMap is a dictionary of Wall images, keyed on the object ID returned from Parse. This allows you to look up a specific Wall Image and update the comments if Parse notifies you of a new comment on an image. Finally, the init and reset methods initialize and empty the collections. These are your objects for the images and comments to display in the Image Wall. image: Contains the uploaded image. objectId: Contains the objectId generated by Parse to uniquely identify each image. user: A dictionary that contains all pertinent Facebook data about the user that uploaded this image; it conforms to Facebook’s FBGraphUser protocol. 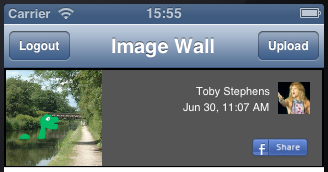 createdDate: Hold the timestamp of when the image was uploaded. comments: A mutable collection of WallImageComments. comment: A string containing the submitted comment. user: A dictionary of the user information detailing who submitted the comment; again, it conforms to FBGraphUser. createdDate: Holds the timestamp of when the comment was submitted. As you can see, both of these classes provide simple ways to store data, and require very little implementation. All you’ve done is add the instantiation and initialization of the comments collection in WallImage. The DataStore.h import MUST come before the Comms.h import since you’ll use the DataStore class in your Comms class later on. Before you go any further, you need to ensure you reset the DataStore each time the user logs in, since you don’t want a user to have stale data from a previous user’s login. Build and run the project to confirm that you have no compilation issues with your new DataStore singleton. 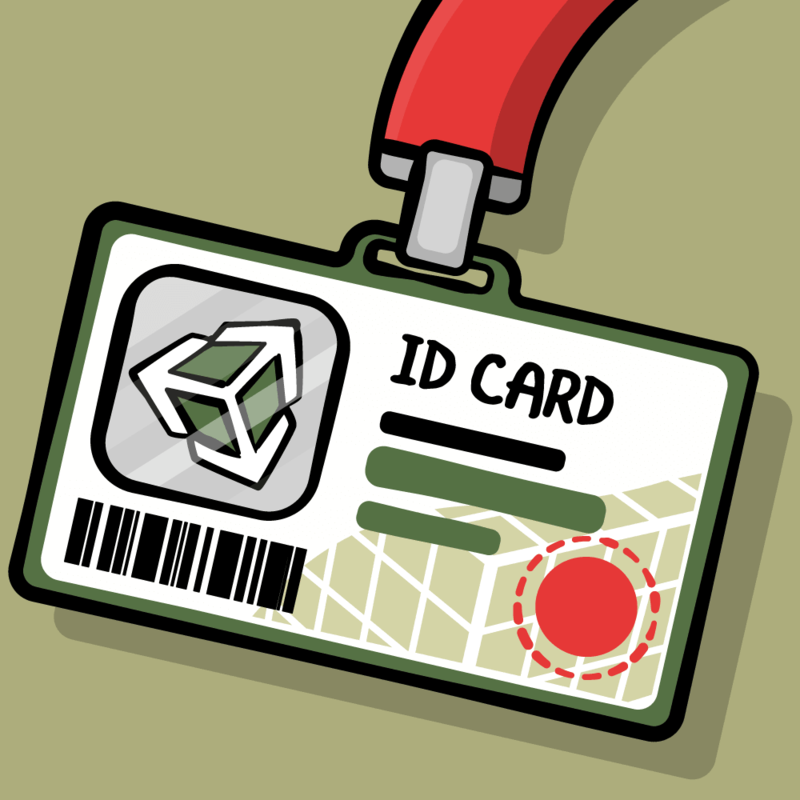 Nothing has changed with the UI — but you’ll get to that real soon! Before you can retrieve the images for the Image Wall from Parse, you need to store the FBGraphUser details of you and your friends in the DataStore. This is so you can know who wall images should be shared with. This stores the user’s FBGraphUser object into the DataStore’s fbFriends list. Yes, you’re not really your own friend, but it’s much easier to retrieve all the images from Parse when everyone is grouped into one list. Build a Facebook Request object to retrieve your friends from Facebook. Loop through the array of FBGraphUser objects data returned from the Facebook request. Add each friend’s FBGraphUser object to the friends list in the DataStore. The success callback to the delegate is now only called once the friends request has been made. To show the images in the Image Wall you will need to first retrieve the images from Parse and then show them in the Image Wall table view. This is your collection of friends’ Facebook user IDs. This is a key part of your query to Parse. the object you wish to retrieve is WallImage. you wish to have them sorted by created date. you only want those images that have been created since the last update. you only want images for you and your friends. In the callback to the delegate you provide a new last update timestamp. Since all Parse operations are handled in blocks, you need to use the __block storage type modifier here so that you can update the variable within the block and use it outside of the block. Loop through the returned WallImage objects. The WallImage object contains the Facebook user ID of the user that uploaded the image. This statement looks up the user from the list of friends to resolve the full FBGraphUser object. Create the WallImage object defined in the DataStore. This contains all the relevant information for the image. If the created date of this image is greater than the current last update date, then set a new last update date so that you always have the most recent timestamp. Store the new WallImage object in the collections in the DataStore. To load the images into the ImageWallViewController, you need to call this method from somewhere. This adds the CommsDelegate protocol to the class and adds a timestamp variable to store the last update time for images. _lastImageUpdate is used to ensure you only request images from Parse that have been created since the last update. Here you set the initial last image update timestamp to a long time ago, in a galaxy far, far away … and make the call to the Comms class to get your images. Warning: A long-running Parse operation is being executed on the main thread. What do you suppose is causing that? In order to load the files from Parse asynchronously, you need to download them using a shared NSOperationQueue. You’ll create an NSOperationQueue category that will give you a background queue for all your PFFile downloads from Parse. Create a New File in Xcode, choosing the Objective-C category as the template. Enter SharedQueue as the Category and NSOperationQueue as the Category on. Now, when you call [NSOperationQueue pffileOperationQueue] you will receive a shared NSOperationQueue which you can use for all of your Parse downloads. Note: When you initialize a new NSOperationQueue, you are basically creating a new background thread. You can call [NSOperationQueue mainQueue] to run code on the main thread as well. 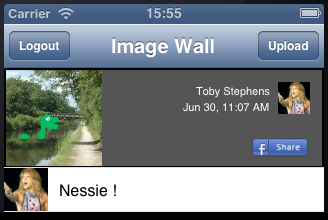 Now to use the NSOperationQueue to download an image from Parse and onto your image wall. You are now passing the image download to your shared queue, so that you’re not doing the heavy lifting on the main UI thread. Build and run your app, login as usual, and the warning should not appear in the log! Here, you update the last image timestamp, ready the app for the next refresh and then reload the table view data. Of course, the table view isn’t going to show anything unless you tell it to, so you need to update the UITableView methods. Each image on the wall is a separate section of the table, with a header view showing the image. Therefore the number of sections in the table will be the same as the number of images in the DataStore. In the above code, you simply populate the header cell with all of the separate pieces of WallImage data you retrieved from Parse. Depending upon your network speed, the image may or may or may not be displayed. Can you tell why this might be? 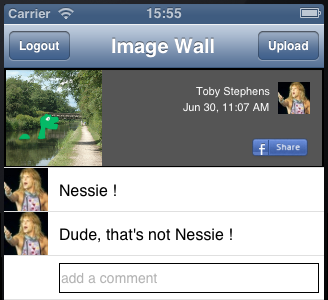 The UITableView is being rendered before the image has been downloaded by the shared NSOperationQueue. As the download of the image is asynchronous it might actually finish after the image wall is rendered, and therefore never show the image. Since the image is downloaded asynchronously from Parse using your shared NSOperationQueue, you cannot guarantee that the image will be downloaded before you render the table view. To get around this, you need to inform the table view when the image has been downloaded using NSNotificationCenter. This posts a notification to the notification center, informing all interested classes the image download is complete. This lets NSNotificationCenter know that the ImageWallViewController class is interested in knowing when an image is downloaded from Parse. When an image has been downloaded from Parse, NSNotificationCenter issues the notification and invokes imageDownloaded: on ImageWallViewController which reloads the table view data. As well, you remove ImageWallViewController from receiving notifications when it is deallocated so that NSNotificationCenter doesn’t try to send any messages to a destroyed object. Now that you have a way of downloading images asynchronously, simply repeat the process to retrieve the user’s Facebook profile picture. Now, calling [NSOperationQueue profilePictureOperationQueue] will provide you with a shared NSOperationQueue for downloading Facebook profile pictures. The above code sets the notification name for downloaded profile pictures. The above code constructs a URL for the location of the profile picture and then downloads the file. It then sets the downloaded image as an object in the FBGraphUser object with a key @”fbProfilePicture”. Once the download is complete, a notification is sent to the notification center. 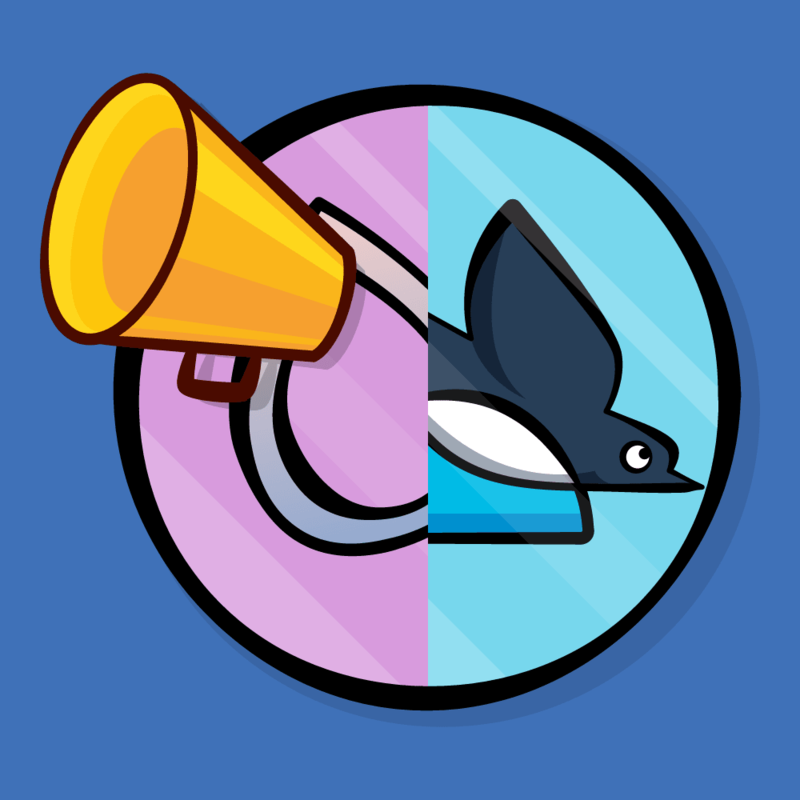 That takes care of your own profile picture; now it’s time to do the same for your friends. Add the following code to login: in Comms.m where you loop through your friend list and add the following code before you add the friend to the friends list in the DataStore. The above code looks quite similar; it does exactly the same thing as as you did for your own profile picture, but does it now for each of your Facebook friends. Now that you have asynchronous loading of profile images, you need to update the Image Wall table view whenever a profile picture has downloaded. The selector imageDownloaded: is the same as the other notification for images downloaded from Parse, since the behavior is the same — it reloads the table data. There’s no sense in duplicating code! 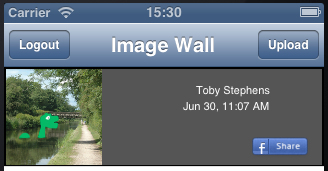 The final step is to add the profile pictures to the section header cell in the table view for the Image Wall. 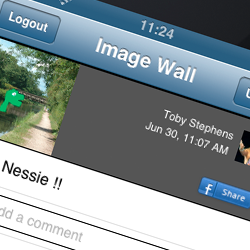 Your app will be a lot more engaging once you allow the users to comment on each other’s images. // In the callback, we will return the latest update timestamp with this request. // Default to the current last update. This should all look very familiar; it’s almost exactly the same as the getWallImagesSince: method, the only difference is that here you’re setting the comments. This stores the timestamp of the latest comment to ensure that you don’t get any historic comments in your request to Parse. Now, once the WallImages have been loaded you’ll fire off a request to get the latest comments. Here, you update the _lastCommentUpdate timestamp with the new value returned from Parse, then reload the table view to show the comments. In your image wall, each of the sections of your table represents a single image, while each of the rows in that section represents a comment. In the above code, you return the number of rows for each section which is the number of comments on that particular image. In the above code, you look up the particular WallImage from the indexPath.section to populate the comments cell. Next, you look up the WallImageComment from the indexPath.row, set the profile picture of the commenting user, and finally set the comment text. Now it’s time to provide your friends with a way to comment on your images. First, you need to create the Comms method to submit a new comment. Since you need to save the new comment to Parse asynchronously and be informed when the the save is complete, NSNotificationCenter will serve the purpose nicely. The above method accepts a string argument — the text of the comment — as well as a WallImage object so that you can link the comment to the WallImage object. Once the saveInBackgroundWithBlock: block has executed, you then post a notification noting that the comment upload is complete. To make things easy for the user, you’ll provide an inline text entry for the user, much like you’d see in Facebook. This will occupy another cell in the table, and will always be the last row of each section. Therefore, you need to add an extra row to the bottom of each section to hold the comment entry cell. This will return an extra line at the bottom of each section of the table for your new comment cell. The above property tells ImageWallTableNewCommentCell which WallImage is being commented on, so you have it for reference later. In the code above, check if this is the last row of the section; if so, set the WallImage for this cell and then return the new ImageWallTableNewCommentCell. Open ImageWallViewController.m and locate the ImageWallTableNewCommentCell implementation. You will notice there is already a textFieldShouldReturn: method set up with no content. This is called when the user hits return on the keyboard – you will implement this method to submit the new comment. The above code closes the keyboard by resigning first responder, and then makes the call to your addComment:toWallImage: method in the Comms class so that the comment is stored on the server. Here you listen for notifications of the submitted comment being loaded into Parse. In the above method, once you receive a notification that the comment has been uploaded, you request the WallImages from Parse again so you can download the latest data, which includes your new comment. When you upload a new image using the app, there’s currently no way to notify the app that it needs to request and download the new app. You’re going to sort that out now with a new NSNotification. This will be the Notification name to use when the new image has been uploaded successfully. Here you tell NSNotificationCenter that you want to listen for notifications of new image uploads; when you receive a new notification of an image upload, you call imageUploaded. When a new image is uploaded, this queries Parse for any new images and gets the new image and accompanying comment. Build and run your project; upload a new image along with a comment and you’ll see your new image appear in the Image Wall once it has successfully been uploaded to Parse. Your app works, and looks great. However, as with any app, there’s always a couple of ways to make it shine. The initialization of NSDateFormatter is a rather expensive operation. It’s not a terribly good idea to initialize it in a table view cell; instead you will create a single instance of NSDateFormatter to use in the ImageWallViewController. 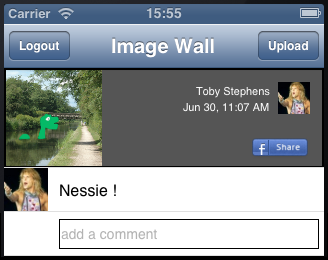 At the moment, the Image Wall refreshes only when you launch the app or upload images or comments yourself. A pull-to-refresh would allow the user to request an update of the Image Wall whenever they wish. Note:UIRefreshControl is only available on iOS6 or better, but there are a huge number of open source libraries for adding pull-to-refresh functionality to older OS versions. One favourite is CKRefreshControl; give it a whirl if you need to support iOS 5 in your app. This checks to see if UIRefreshControl is supported in the OS, and if so, instantiates the UIRefreshControl and sets action selector to refreshImageWall:. The above method checks if the caller passed in a UIRefreshControl. This check is necessary since you’ll use refreshImageWall to refresh the table view in other situations that don’t use the refresh control, such as after uploading an image or comment.Then you call getWallImagesSince:forDelegate as you have before. Now you can tidy up all the calls to getWallImagesSince:forDelegate in the rest of your code. This will have the same effect, but use your new method instead to refresh the table. There — that looks a lot cleaner. All that’s left is to clean up the UIRefreshControl after the refresh is complete. Build and run your project. 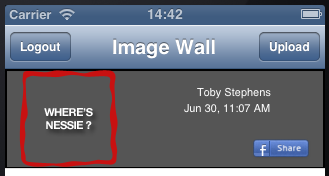 If you’re on iOS6 or better, you can now pull down the Image Wall to refresh it. Astute readers will have noticed that the app has a Facebook Share button sitting on the section headers in the Image Wall. This button is all wired up in the Storyboard for you to share your image on Facebook. To learn a bit more about the Facebook APIs, try to add the code that takes care of publishing your images to your Facebook feed. Another neat offering from Parse is their new app-driven push notification. If you’re familiar with setting up push notifications, then it should be a simple manner to update your app to listen for new comments on your Image Wall and respond to the push notification appropriately. If this is something you’d like to try, take a look at Apple Push Notification Services in iOS 6. Then, read through Parse Push Notifications for more detail on how to hook up push notification Parse. You can download the completed project for this Parse tutorial series here, including an implementation of the Facebook share noted above. I hope you’ve enjoyed learning about Facebook and Parse; feel free to post your comments or questions about integrating Facebook and/or Parse, along with any suggestions for related tutorials in the future!